The cottage is the last remaining cottage built just after the New Zealand Wars in the 1860’s. Two bedrooms, queen bed opening on to veranda, two single beds, bed in sunroom; lounge has a couch that opens into a double bed, open fire, shower, laundry facilities. 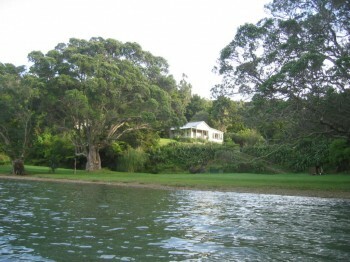 The cottage sits in a private bay above a sandy harbor beach. The beach is safe for children swimming shower on the beach. There are two ride-on kayaks for paddling in the wider Parua Bay Area. Mooring available in Bay for up to 10 metre boats/yacht or Boat launching at Marina only 3 kms. Walks are available on property through mature Kauri Forest, rare native birds – Kaka with plenty of Tui bird song. Volley ball court can be erected beside beach, great setting for picnics and relaxing. Camping is available on beach or provides an excellent venue for weddings with reception at Parua Bay Tavern 2.5 kms away.